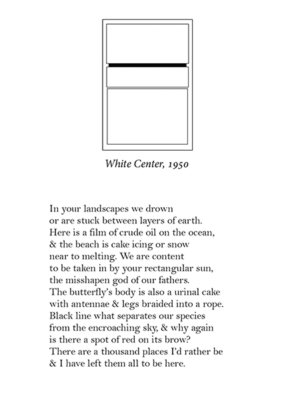 An ekphrastic work of poetry with a focus on the paintings of Mark Rothko. Certain people always say we should go back to nature. I notice they never say we should go forward to nature. Cover art & interior word art by Aaron Sing Fox; interior assemblages by Martin Rock. If you prefer, you can order this book through your local bookstore. Doing this will help BAP grow in your community. Mark Rothko’s paintings have the aura of the sacred, the immanence of a revelation, the promise of a secret that is always just about to be disclosed. Martin Rock responds to Rothko’s hushed eloquence with his own quick-hitting intimations of mortality, spiritual poems that deftly enter Rothko’s visionary space, his intimate, anguished, violent, and fateful dramas. 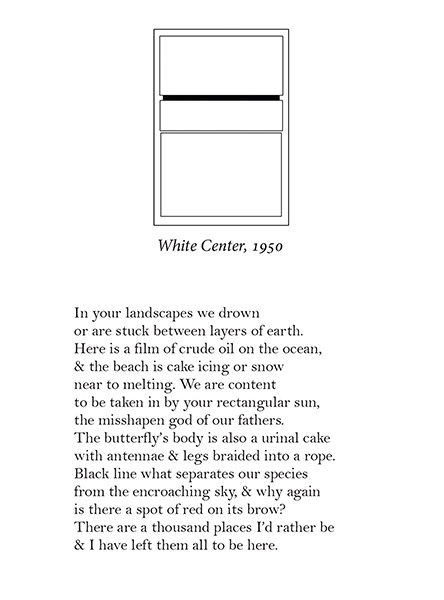 DEAR MARK is an unabashed open letter to Rothko’s paintings that pushes past what the rest of us have thought of them. Martin Rock inhabits these paintings and the imagination in exciting and lyrical poems all springing from color and abstraction but ending in the strange and beautiful. Rock reminds us that art goes both ways, and it takes a talented viewer to see what’s there. 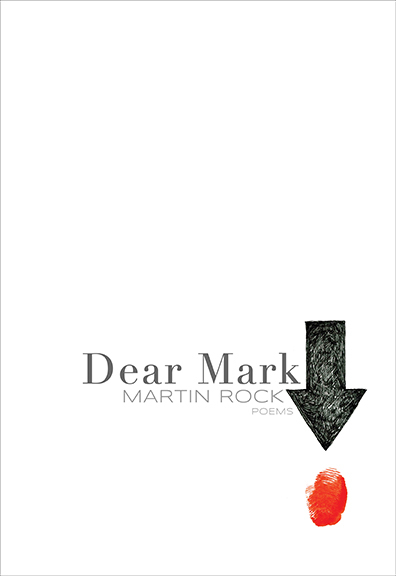 There’s such calm beauty in Martin Rock’s poems. The delicate pace allows us to look, listen, be present. But he’ll lead you into this blissful state, look you straight in the eyes, and tell you “The butterfly’s body is also a urinal cake / with antennae & legs braided into a rope.” He’s a philosopher and soothsayer with a strange sense of humor. “Life is a kind of rust” in his poems. So he looks to the future life, and the past life. Indeed, the poems here are concerned with life—from the primordial soup, to “on the body of a spider / death’s head.” It’s a stunning collection. One I look to for guidance in existence. 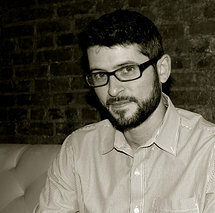 Martin Rock is a poet, editor, and teacher living in Brooklyn. He lived in Japan for nearly four years, where he taught elementary and junior high school and studied Japanese. His poetry has appeared or is forthcoming in Black Warrior Review; Conduit; DIAGRAM; Forklift, Ohio; H_NGM_N; Third Coast; The Journal, and was included in Best New Poets 2012 and featured recently on the websites Brooklyn Poets and The Bakery. With Philip D. Ischy, he wrote the chapbook Fish, You Bird (Pilot 2010). He has served as Editor in Chief of Washington Square, as Managing Editor of Epiphany, and is currently Editor in Chief of Loaded Bicycle. The recipient of fellowships from New York University, Port Townsend Writers Conference, and University of Houston, he will soon move to Texas to begin a doctoral candidacy in literature and creative writing.